10.05.2010 - Remediation Products, Inc.
We know, we know, it’s a bit soon to be thinking winter snow. But we can’t help but celebrate news of an NFA accomplished under a deep freeze. 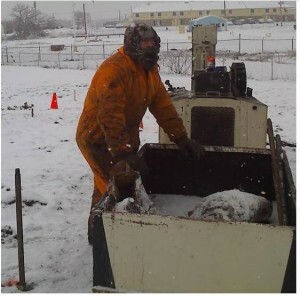 Operating under severe winter weather conditions, AST Environmental, Inc. performed a single-event injection plan to remediate free product petroleum LNAPL (0.1 foot to 1 foot of free product) in the groundwater at the Magellan City Terminal in Iowa City, Iowa. The injection grid was broken down into five separate areas (approximately 500 sq ft each) and with each area having injection depths from 14’ to 28’ bgs. The injection sites varied in total pounds of BOS 200® required to directly target contamination reduction goals. 65 injection locations used a total of 24,000 lbs of BOS 200® overall, along with approximately 50 gallons of concentrated bacteria installed using AST’s high volume, high pressure injection system. Keith Piontek with TRC Solutions in Eureka, Missouri was the environmental consultant on the project. 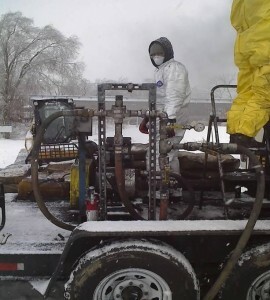 Within one month of injection, free product was removed from the site and the site was moved to dissolved phase petroleum hydrocarbon remediation (aka plume remediation). Nine months later? A No Further Action (NFA) for the dissolved phase petroleum hydrocarbon remediation, and direction from the Iowa Department of Natural Resources to remove all monitoring wells from the site. Learn more about how BOS 200® and other Trap and Treat® products can eliminate groundwater contamination and save you money. Visit our website at trapandtreat.com, or click here to contact us.